I have a confession to make. It is about this really, really bad food-crush of mine. Her name is la galette. We met for first time some years ago. In the middle of the French Alps, with local friends, I went to a crêperie… These cozy, usually brasserie-type restaurants are where once you enter, your nose is tickled by the irresistibly scrumptious smell of freshly baked pancakes. The funny thing is: there are only two items on the menu, the crêpes (sweet pancakes made with wheat flour, sugar, and milk) and the unknown-to-me at that time galettes (savory pancakes made with buckwheat flour, water, and sometimes an egg). Each of these can be served topped with different items, giving guests a huge list of choice. The galettes menu, for example, starts with the simple ones — having only salted butter on top or cheese and eggs, up to elaborate versions with smoked salmon and cream, or fois gras (duck liver) and veggies. The galette saucisse is a typical way to enjoy this pancake, which is wrapped around a sausage and eaten like a hotdog. Regardless the fillings and toppings the galette-experience is completed by a bowl of French cider (cidre) or pear wine (poiré). 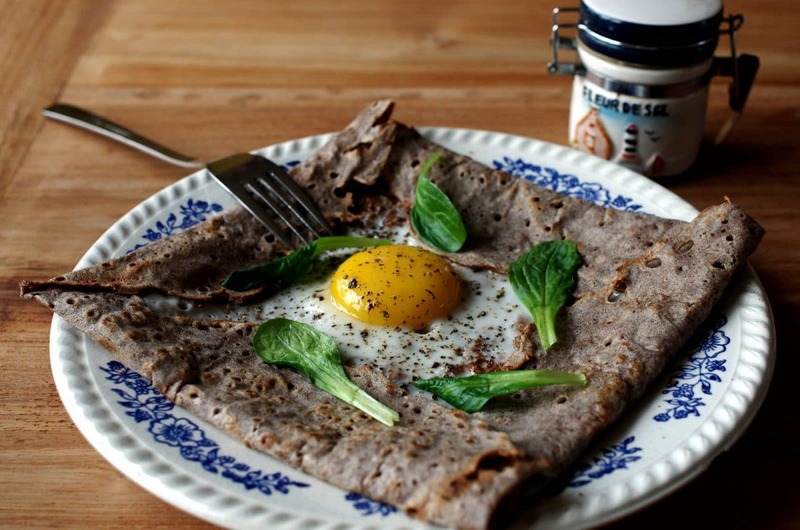 If you happen to get addicted (like me) to the nutty and intense galette flavour, connected to the stronger taste of the buckwheat, don’t be too shy to order your sweet pancake with the buckwheat dough. The waiters might in some cases roll their eyes (or even ask you twice if you ordered it correctly), but believe me a galette aux noix+miel (buckwheat pancake with walnuts and honey) or a galette au chocolat (one with chocolate) is a one in a million gourmet experience! However, the endless French cuisine offers opportunities for things to get a little mixed up too. For example, if you are into salty things make sure you don’t go for the galette des rois which is a thick sweet cake made for the 6th of January and has obviously nothing to do with the galettes au sarrasin. And next time you are in France look for a crêperie, because even if the galettes are a specialty from Bretagne, one may enjoy them all over the French country. One Response to "La Galette, the French Savoury Pancake"